Plastic football trays are large enough to hold pretzels, chips, popcorn, cookies, cupcakes and more. 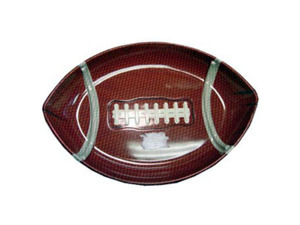 Great for football parties, sports themed parties and makes an eye-catching centerpiece. Made of durable plastic. Tray is brown with gray stripes and raised laces. Measures 17 3/4" x 11 3/4".